If you have done any kind of research on bike racks, like we have, you are very familiar with the brand Hollywood by now. 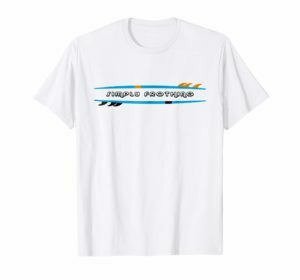 They have been around since 1973, started out as a small business in the back of a bike shop in Hollywood, California. Since then, they have grown into one of the biggest names in the bike rack industry, manufacturing a variety of bike rack products with very competitive price points. They currently operate in all 50 states and 25 different countries worldwide. One of their most popular product lines is the hitch mounted 4 bike rack. There are multiple models, let’s find out which one might be the best fit for your needs. Click the item in the table below to skip to the part of the article that interests you the most or continue reading the whole review below. What is a hitch mounted bike rack? 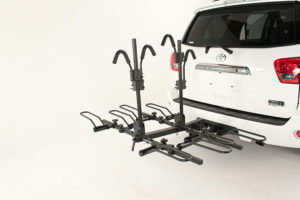 A hitch-mounted bike rack is a rack that slides into the receiver of a trailer hitch on a car or a truck. This type of rack has some advantages over roof-mounted or trunk-mounted bike racks. A roof mounted or a truck mounted rack may not be safe, stable, or available for every vehicle and usually, it is not easy to load or unload multiple bikes. A hitch mounted rack solves these problems in most cases. It can carry multiple bikes and makes it easy to load and unload bikes. HR1400 Sport Rider comes pre-assembled and adjustable. It mounts on a 2-Inch hitch and it can hold 2 or 4 bikes so it gives you flexibility. The bikes drop into wheel holders and it has padded clamps that slide down onto frames. You do not need tools for the hitch system, it has a locking pin and a 9-Feet security cable. You can easily fold it flat against vehicle when you are not using it. The tension bolt stops the rack from swaying especially after adding the bikes. It is versatile, loads asymmetrical bikes well. You can put an adult bike and a kid’s bike with training wheels on the rack in 2 bike mode. Additionally, it is possible to put 16″ or larger bikes on this rack, however, you may have to put the bike with the smaller seat first, then the others. You may have to play around with it to find out the best fit. The Velcro wheel holders are sturdy enough to ensure that the bikes do not move. Easy to fold up and tilt down. 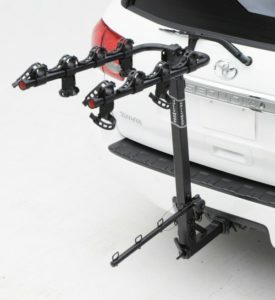 This feature makes this rack more convenient for you and your car than a trunk mount rack. 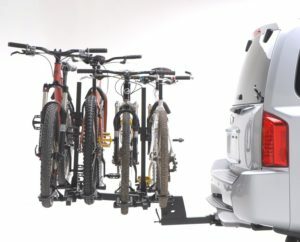 You can lower the rack with bikes on it in order to access the rear door of an SUV. Obviously, this feature may be easier or a little harder depending on the SUV itself. Some owners stated that they can do this easily, a few others mentioned, while it can be done, it is usually a two person job. It works great with a Class 3 hitch, it is pretty much made for a Class 3. A fat bike wheel fits as well. If you would like more information on different hitch classes,you can click here for more information. A big plus for this rack is its price compared to its competitors. It is large and heavy, which might make storing it when not using, challenging. Weighs around 85 pounds with a 2-inch receiver and measurements are 27 x 10 x 36 inches. If you have to attach and detach it from your vehicle regularly, its size and awkward shape might be an issue. However, if you break it down to two pieces, it might make it easier to move and store. Some buyers have mentioned buying a lock for the 4 bike attachment portion to prevent it from being stolen. Obviously, that is not a shortcoming of the rack, but we felt like it might be something to consider depending on where the rack will be stored. It may not be safe to hitch it on the back of an RV. Also, it may be too heavy for a car because of how much it weighs. It should not be used with a Class I trailer hitch. You can click here to view to details from the manufacturer on this subject. The manufacturer’s web site specifically states it should not be used on any trailer, fifth wheel or towed vehicle. This rack may be considered the smaller brother of the HR1400 above, and based on our research, is highly praised. Let’s look at the pros and cons of this model, and let you be the judge. It can carry up to 4 bikes. It comes with keyed alike locking hitch pin and an 8′ (96 inches) security cable; both keyed to the same key with 4 keys. It is pre-assembled and its patented no-wobble hitch system eliminates slack between receiver hitch and racks for better safety. 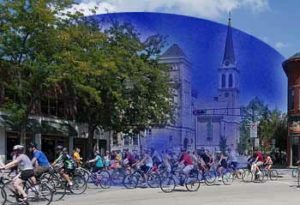 There is an extra stabilization bar at the bottom which prevents bikes from spinning around while in transit. Other features are: Durable rubber bike cradles with integrated anti-sway stabilizers and the hitch tightening system. All these safety measures make HR400 a stable solid bike rack that will not damage your vehicle (* please see the cons section about this, for a comment from a buyer). It can be mounted quickly and securely, usually, does not require more than one person. 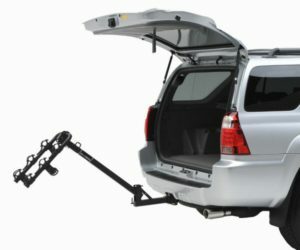 Naturally, removal is easy as well, and the unit can be folded back to allow access to the trunk of your vehicle. You do have an option of strapping the bikes to a lower bar that helps stabilize the bikes, even though you do not have to do this, it is recommended that you do if you are planning on going on a long trip. One reminder, if you are loading 4 bikes, even though it is long enough for all the wheels on 4 bikes, it may not be enough for all the wheels AND frames. It is not that heavy or big in size. This makes it ideal for smaller SUVs or cars. It fits 2″ hitches only. This is not a knock on the product, it is what the rack is made for. It may not work with vehicles that have a rear gate that swings to the side and not up, such as a Jeep Wrangler. 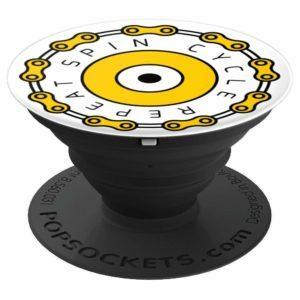 It is primarily designed for adult bikes, so it may require some creativity for kid’s bikes. It cannot be used on any trailer, fifth wheel or towed vehicle. All Hollywood 4 bike racks come with a limited life time warranty. If you would like to review the manufacturer’s warranty, please click here. Both these products are not light when it comes to shipping, so shipping cost will not be cheap. 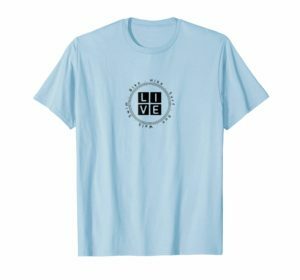 This is where a website like Amazon might be the right place to purchase. Amazon usually offers free shipping for purchases above a certain dollar amount. For the price points for the bike racks discussed above, it is very likely that either rack will be shipped for free. Also if you are an Amazon prime member, that comes with a lot of added benefits,such as free 2 day shipping. Please refer to Amazon.com for up to date detailed information. Buyers seem to highly praise both HR1400 and HR400 as reliable bike rack options. The value you are getting for the money you are spending for a Hollywood bike rack seems very competitive. HR1400 Sport Rider SE seems to be a very good choice if you are looking for a heavy duty, durable, 4 bike rack for a truck or larger SUV. If you don’t think the size and the weight of the unit is a major issue, you may want to consider it as your next, and hopefully the last (at least for a while), 4 bike rack for your truck or your SUV. HR400 seems more suitable for a smaller SUV or a car because of its weight and size. Both racks have overall received very positive feedback from buyers. They are durable, so combined with the fact that they usually cost less than their competitors, it looks like you are getting more than your money’s worth, with either one. If you would like to view the manufacturer’s vehicle fit guide for its hitch mounts, you can click here. This entry was posted in Bike rack, Hollywood Bike Rack, Reviews on January 21, 2017 by ozziewizzard.